Often acclaimed as an ideal herb for meditation and introspection, Calamus is recommended by saints, yogis and Ayurvedic philosophers for enhancing the functions of the brain, improving memory power, increasing intellectual capacity and for stimulating proper circulation to the brain. The essential oil of Calamus is extracted from the root of the Calamus plant, scientifically known as Acorus Calamus or Sweet flag by steam distillation method. The Sanskrit name of Calamus is Vacha, which means ‘speech’ and the primordial sages and religious Gurus have believed Calamus to facilitate human beings to articulate from their highest inner consciousness. Ayurveda recommends Calamus herb for its power to fortify the adrenal gland and for its effectiveness in treating neuralgia, dysmennorhea or painful periods, memory loss, epilepsy, gingivitis, lack of stamina, lymphatic drainage, asthma, hysteria, deafness, sinusitis, lack of consciousness and trauma. Calamus is native to Asia and Europe and has been found growing across Australia, South Africa, North America, New Guinea and Reunion. It has its name mentioned in the Old Testament and was talked about in Exodus as an element of the sacred anointing oil of the Bible. It was also denoted in the Chester Beatty papyrus VI, which approximately dates back to 1300 BC and Papyrus used Calamus with various other ingredients in preparing a bandage to appease stomach ailments. Calamus has been a vital part of the traditional healing system of various countries for more than thousands of years in the treatment of numerous medical conditions. The primeval Egyptians trusted Calamus root as a potent aphrodisiac for its effectiveness in augmenting the health of the reproductive system. Calamus was added to wine in Europe and it also forms a part of absinthe. The Penobscot people believed that Calamus root helped in healing prolonged sickness that was plaguing the people for a long time. They also steamed all through the homes to ward off illnesses and the dried roots were strung together for preservation. The people of the Potawatomi community used the dried Calamus root powder for treating catarrh. Indonesians use this aromatic root as a flavoring agent in the preparation of meat, sea foods and other vegetarian cuisines. The warriors of Teton-Dakota applied the root paste on their faces for alleviating fear in the warfront. Calamus essential oil is also used in making perfumes mainly because of its therapeutic properties. The traditional Turks used this herb for all kinds of infections and it is used in preparing cough drops. It is also been used in the Traditional Chinese medicine, Siddha and Ayurvedic healing systems for its carminative, laxative, sedative and diuretic properties. The primary chemical components of this oil are beta asarone, eugenol, calamusenone, corenone, alpha aselinene, camphone, alpha calacorene, shyobunone, beta gurjunene, calamendiol and iso shyobunine. 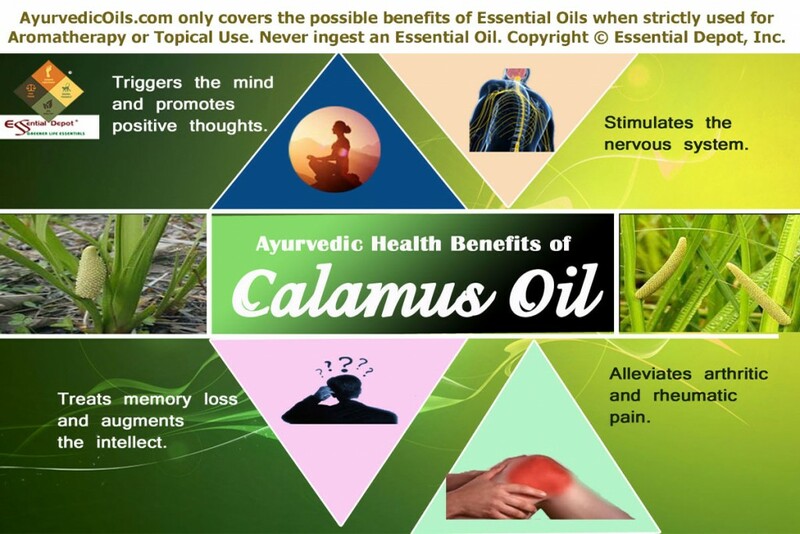 The therapeutic properties of Calamus oil are rejuvenative, circulatory, anti-spasmodic, anti-arthritic, cephalic, nervine, tranquilizing, stimulant, decongestant, anti-rheumatic, emetic, anti-periodic, memory boosting, carminative, stomachic, bactericidal and expectorant properties. Numerous research reports have proved that Calamus is one the most commonly employed ingredient in plenty of Ayurvedic preparations, mainly because of the presence of essential oils in its rhizomes. Ayurvedic medications like kashayam, choornam, ghritham and tailam contain Calamus and are prepared by following the preparation methods mentioned in Sahasrayoga. 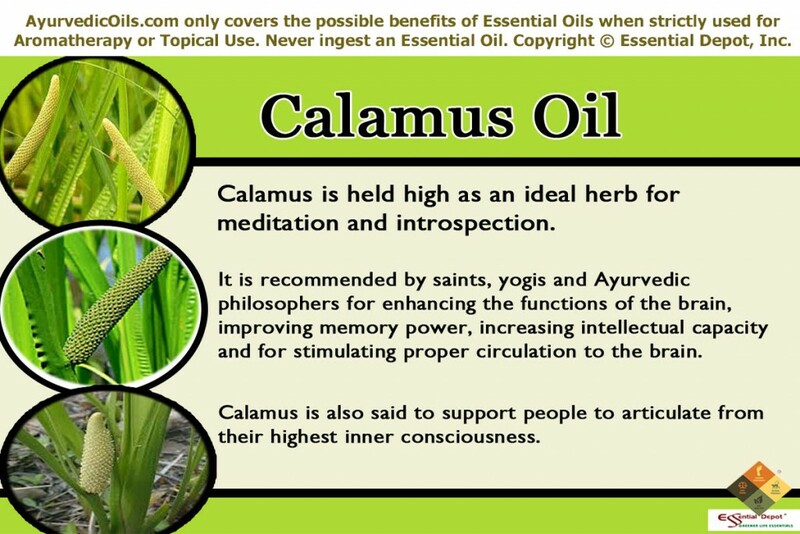 Calamus essential oil is habitually called as a tonic for the brain in Ayurveda. It has been mentioned in Vedas, the holy books as one of the exceptional medicines and Ayurvedic philosophers explored numerous healing benefits of Calamus apart from supporting the functions of the nervous system and brain, for which Calamus still exists as a vital part of various Ayurvedic medicines since 4,000 years. Perfect health according to Ayurveda is a triangular structure with body, mind and soul as its edges. It is the oldest of all healing systems on earth and is the pioneer to other traditional and modern medicinal methodologies like Homeopathy, Siddha, Traditional Chinese medicine, Unani, Acupressure and Chiropractic. The greatest thing about this ancient medicinal science is that its healing techniques are documented systematically since its first recordings in Atharvaveda, one among the 4 Vedas or the major sacred books of the Hindu mythology. This ancient citation was followed by Charaka Samhita and Sushruta Samhita, known as Ayurvedic encyclopedias written by the most respected Ayurvedic philosophers Charaka and Sushruta respectively. “The three – body, psyche, and soul – act as a tripod. The world stands upon them, and within them, the world abides”, says Charaka Samhita. Ayurveda rightly means ‘the knowledge of life’ and this time-honored remedial method assists in providing the consciousness about life and health in every individual. Ayurveda states that nature is made up of five fundamental elements namely water, earth, fire, air and space and it is also said that everything in nature is also built up with these five energies. When a person’s health is in balance with nature, absolute health prevails and imbalance with nature owing to food, climatic conditions and lifestyle changes causes illnesses. Being a holistic curative system, where every person is regarded as a special part of nature with a unique individual constitution just like the fingerprints and it consists of three imperative dynamic energies called as doshas. They are vata, pitta and kapha and are nothing but a representation of any two elements of nature. Vata dosha is a combination of air and space, and is responsible for respiration, circulation and for the functions of the nervous system. Kapha signifies earth and water, and is in charge for sustenance, physical structure, movement of fluids in the system and the reproductive health. Pitta symbolizes fire and water and is accountable for body temperature and metabolic functions like digestion, absorption and excretion. Stability between these three doshas signifies perfect health and inequality causes sickness. Ayurveda recommends natural remedies including herbs, essential oils, simple physical exercises, yoga, prayers, meditation, Pranayama, Ayurvedic routine, Panchakarma (Ayurvedic techniques for detoxification) and Ayurvedic massaging with natural essential oils. These remedies are prescribed in such a way to correct the unevenness between the doshas. Calamus essential oil is known to aggravate pitta and pacify kapha and vata dosha. Calamus herb and its essential oil have been witnessed by numerous herbalists and Ayurvedic physicians as an endlessly safe and useful natural remedy for activating the mind and improving the power of thinking. It is popularly known as a boosting herb for meditating Yogis and Saints, where Calamus is said to help them stay focused and concentrated in their long lasting meditation known as yagna. Calamus was used in the preparation of tea in the ancient period and was also used in neti pot as a powerful remedy for treating brain conditions. Adding 1 to 2 drops of Calamus essential oil in diffuser, vaporizer, burner or a tissue paper and inhaling the uplifting aroma of this oil can aid in opening the mind, promoting clarity, enhancing the concentration power, mental stability, attention, and the power of positive thinking along with organization of speech. Swami Thirtha calls Calamus as “one of the best mind herbs”, mainly for its effectiveness in fostering sadhaka pitta through which it fortifies the mind’s ability to obtain information and evoke from the memory. The essential oil of Calamus has an invigorating effect on the brain with its warm, woody and medicinal aroma with increasingly sweet after-tones. 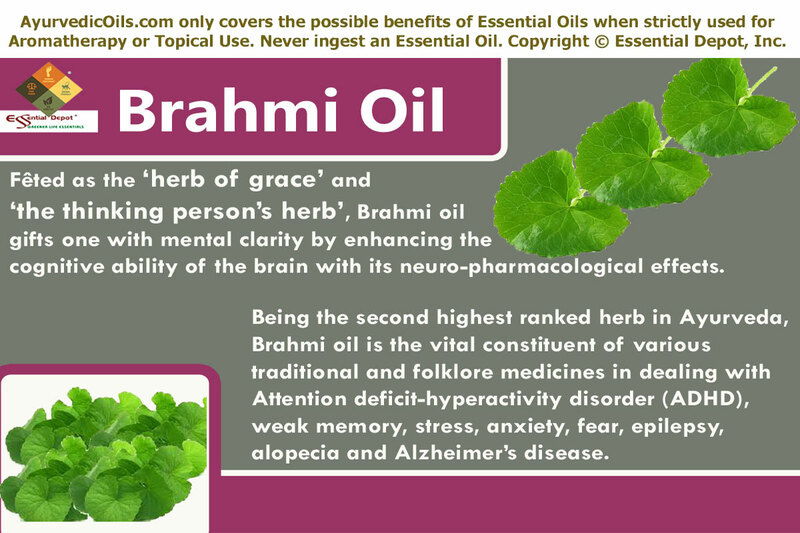 Inhaling the therapeutic fragrance of this oil helps in activating the neural pathways and has also been proved powerful in treating neurotic problems. You can also add 2 drops of this oil to warm bathing water for refreshing your mind. Ayurvedic practitioners recommend Vacha oil to persuade positive thoughts. Calamus falls under the ‘sattvic herb’ category in the Ayurvedic medicinal system. All the sattvic varieties are known to enhance and empower the ‘kundalini’ energy or the ‘vital life force’. By this way, Calamus and its essential oil acts as a revitalizing nerve tonic that augments the functioning of the brain. Massaging your system with 5 drops of Calamus oil mixed with 2 drops of Lavender oil, 2 drops of Lemon oil, 2 drops of Yarrow oil, 2 drops of Cinnamon oil and 2 drops of Patchouli oil along with 10 ml of Virgin Olive oil can aid in rejuvenating your brain and the entire nervous system. This assists in stimulating the cerebral functions, support self-expression and overall nervous health. This massage also assists in promoting peaceful sleep and treating insomnia. Ayurvedic healing system describes this oil as a nervine tonic and a psychotropic remedy, mainly for its positive effects on learning, boosting memory, recovering from shock and treating depression and anxiety. Calamus herb and its essential oil are recommended by Ayurvedic physicians for confiscating the negative effects and toxic residues of drugs (including the heavy use of marijuana) from the fatty tissues left within brain, liver and the nervous system. 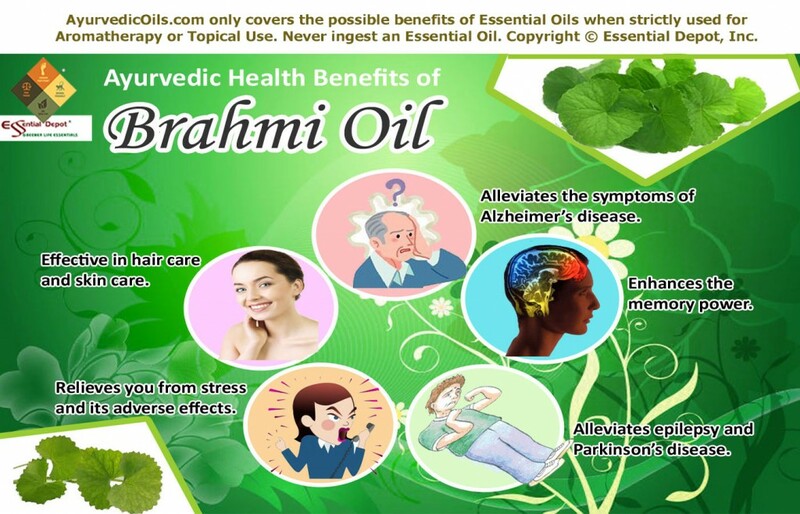 By strengthening the nervous system, this oil is also used in recovering from trauma, post-surgery effects, hysteric attacks, epileptics and certain other nervous problems. Due to its potential to contract the blood vessels and decrease pressure on the Ninth cranial nerve, Calamus oil is used in treating neuralgia. For its memory-enhancing properties, Ayurveda prescribes Calamus oil as an effective psycho-pharmacological agent and the as one of the best natural remedies for treating epilepsy, mental retardation, syncope and stupor, while augmenting memory power and for retrieving people from traumatic problems. Calamus is used in Ayurveda to counteract the side effects of hallucinogens. This essential oil has been proved to enhance blood circulation, stimulate neurons and nerves, aiding the body to attain steadiness and attentiveness. 4. Alleviates arthritic and rheumatic pain: According to the Ayurvedic philosophy, excess of kapha dosha is responsible for stagnation of toxic substances known as ama, water deposits, salt, uric acid and other fluids in the body, especially in the joints causing pain and inflammation associated with rheumatism. Calamus essential oil is a known Ayurvedic remedy for reducing excess kapha dosha and helps in lessening pain, inflammation and redness by eliminating stagnated fluids and toxic remains through urine and sweat. Mix 2 drops of Calamus oil with 2 drops of Ginger oil and 2 drops of Eucalyptus oil along with 3 ml of coconut oil and massaging it gently on the painful area helps in promoting blood circulation, alleviating pain, strengthening the muscles, stimulating the nerves and reducing swelling and other symptoms of rheumatism and arthritis. With its pungent and bitter taste, Calamus oil is said to have excellent benefits to the respiratory system, nervous system and the digestive system. This oil strengthens the digestive system and treats intestinal worms, abdominal pain, flatulence, loss of appetite, chronic gas trouble and loss of taste. Vacha is used in many Indian homes to treat colic in newborn babies since the primeval times. Calamus essential oil effectively treats sinusitis, cold and bronchitis. This information is only for the purpose of education and is not intended to cure, prevent or diagnose any medical condition. It is not directed as a substitute for any prescribed medication or expert medical advice. 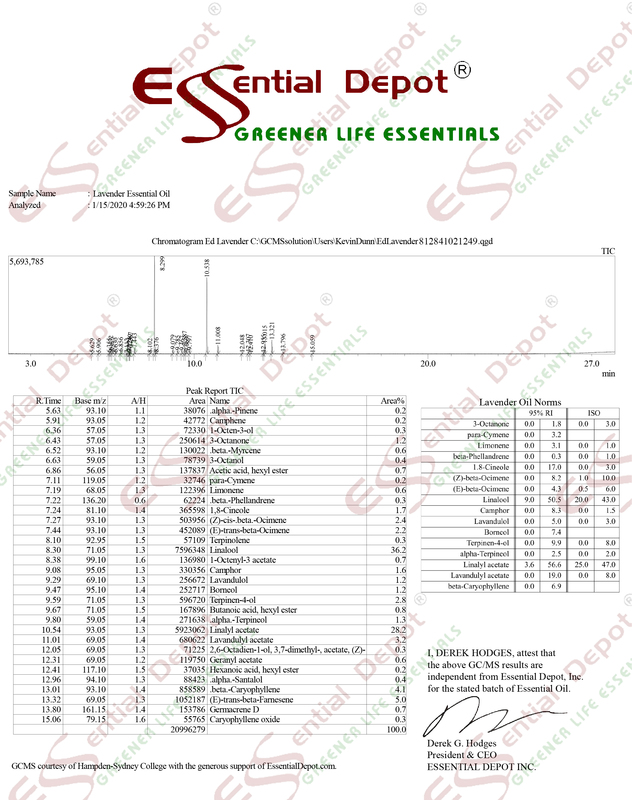 We are not medical professionals and this data is shared only for the purpose of throwing light on the ancient healing wisdom or the knowledge of life known as Ayurveda. Never use essential oils internally and ensure that you use them in a diluted form for external use, as pure and organic essential oils are highly concentrated liquids. Keep essential oils out of reach of children and it is always recommended to do a small patch test on your skin with the diluted essential oil. Speak with your healthcare expert or your Ayurvedic physician before choosing the appropriate essential oils for your unique individual constitution or prakriti and health condition. The essential oil of Calamus should be strictly avoided during pregnancy as it has the potent to stimulate contractions in the uterine cavity and induce menstruation, being an emmenagogue and might lead to miscarriage or abortion. It is also advisable to restrict the use of Calamus oil during breastfeeding. Many studies suggest that Calamus oil may have carcinogenic or cancer causing effects and might be toxic when used in excess. The prime chemical constituents responsible for its adverse effects are β-asarone (about 78.4%), α-asarone (about 6.8%) and methyleugenol (about 2%) in Acorus Calamus oil, which is of Indian origin. Various in vivo and in vitro studies have witnessed the negative potent of β-asarone in inducing the growth of malignant tumors. The European Council files β-asarone as “substances which are suspected to be genotoxic carcinogens and therefore no MDI can be set”. According to the 1988 European Community Council, both the European Union and the United Kingdom ‘Standard Permitted Proportion’ of beta-asarone in food flavorings must be 0.1mg/kg. IFRA (International Fragrance Association) suggests that beta-asarone and alpha-asarone should not be used as fragrance ingredients and the safe level of use of Calamus oil in consumer products should not exceed 0.01%. It also recommends that the highest concentration of methyleugenol in leave-on products like body lotion should not exceed 0.00004%. Essential oils are highly concentrated substances and must be used in a diluted condition with safe carrier oils like coconut oil. 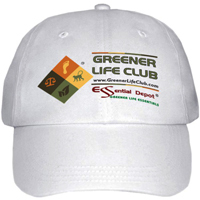 It is meant only for topical application and it is not recommended to take essential oils internally. Ingestion of Calamus oil may end up in creating hallucinations, convulsions and potent toxicity. Acorus Calamus is one among the 30 unsafe herbs listed by the FDA (Food and Drug Administration). According to the studies conducted in 1976 and 1977, Calamus oil is non-phototoxic and non-sensitizing when tested (patch testing with 2% Calamus oil) on 200 consecutive patients with dermatitis. This warning is relevant to leave-on skin care products like creams, body lotions, massage oils and balms and not for wash-off items like shampoos and soaps.